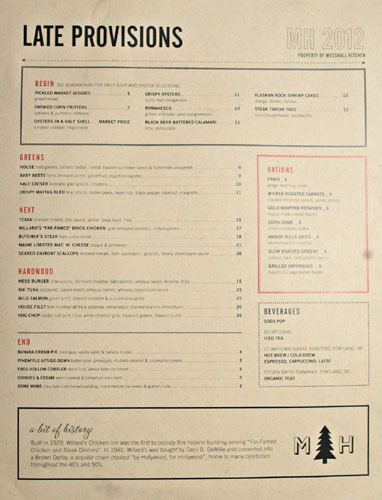 Without a doubt, one of the more highly-anticipated openings of the year so far has been MessHall, the brainchild of Rob Serritella and Bill Chait (contrary to earlier reports, the restaurateur Wunderkind is actually a minority partner here). It's a reworking of the Louise's Trattoria space in Los Feliz, and features the modernized "camp cafeteria cooking" of Chef Keith Silverton (no relation to Nancy) in a gastropub gastro tavern setting. The place soft-opened on Friday the 7th, while tonight was the restaurant's official debut. About the Chef: Silverton is a native of Puyallup, Washington, and started his culinary career under chef and Le Cordon Bleu-instructor Musa Kalles. He opened Cutters at Pike Place in nearby Seattle before taking on a role at Restaurants Unlimited, where he spent five years overseeing the launch of 13 corporate-y type restaurants. Following, Silverton moved to the Bay Area and went to work at Mark Miller's Fourth Street Grill in Berkeley (a Chez Panisse offshoot). He then secured employment at Jeremiah Tower's seminal Stars in San Francisco, the landmark Bruno's nightclub in the Mission (under James Ormsby), and the Park Hyatt at the Embarcadero (now the Le Méridien). In 1998, Silverton relocated to Los Angeles to become Michael Cimarusti's Sous Chef at Water Grill, but his time there was short. He quickly transitioned to an Executive Chef position at the French-Mediterranean Cyrano in West Hollywood, then went to work with Jon Fernow and Rainer Schwarz at Cienega. 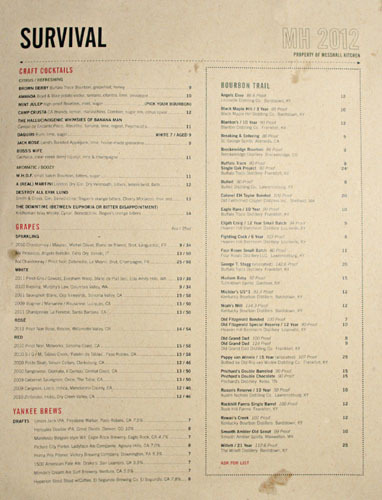 In June 2000, Silverton partnered with Jon Sidel to debut Dominick's in WeHo, and would stay there until 2003. In January the following year, he became the head chef at the Spider Club at Avalon Hollywood (formerly Hollywood Palace), and two years later, began working at Smitty's Grill in Pasadena. Then, in September 2007, Silverton debuted LIFT with Steve Adelman inside the Hudson Apartments, and also began heading things up at the co-located 86 Supperclub. Both ventures, however, were 86'd (ha!) the following year; LIFT became Hudson Bistro, and 86 was rechristened Hush Lounge. With those unpleasantries behind him, Silverton took the reins at West Hollywood's Nonna of Italy, a position he would retain before decamping to start work on MessHall. MessHall is housed in a 14,000-square-foot structure that was once the Brown Derby. The space has been reimagined by Greg Bleier of Studio Unltd (he also did BierBeisl) and features a whopping 175 seats, as well as a corrugated metal bar and a patio area outside, replete with fire pits. The theme is sort of like industrial-chic meets Army dining hall, and naturally, as with any good restaurant opening these days, exposed brick, reclaimed wood, and communal tables are to be found in full effect. A bit of history: The building was actually constructed in 1929 as Willard's Chicken Inn, but was purchased by famed director Cecil B. DeMille in 1941 and turned into the last outpost of the Brown Derby chain (a popular spot with the entertainment elite during Hollywood's Golden Age). In 1960, the restaurant became Michael's of Los Feliz, and remained as such until the end of 1992. The following year, the space was transformed into The Derby nightclub (it was where Swingers was filmed) and Louise's Trattoria. The Derby eventually turned into a Chase bank branch, and in June 2004, the site was purchased by a group led by Adler Reality Investments, which had plans to raze the structure and construct a condominium complex in its place. However, the building was deemed a Historic Cultural landmark in 2006, forcing the group to sell the property for $9.25 million earlier this year to CMC Asset Investments, which plans to operate things as-is. 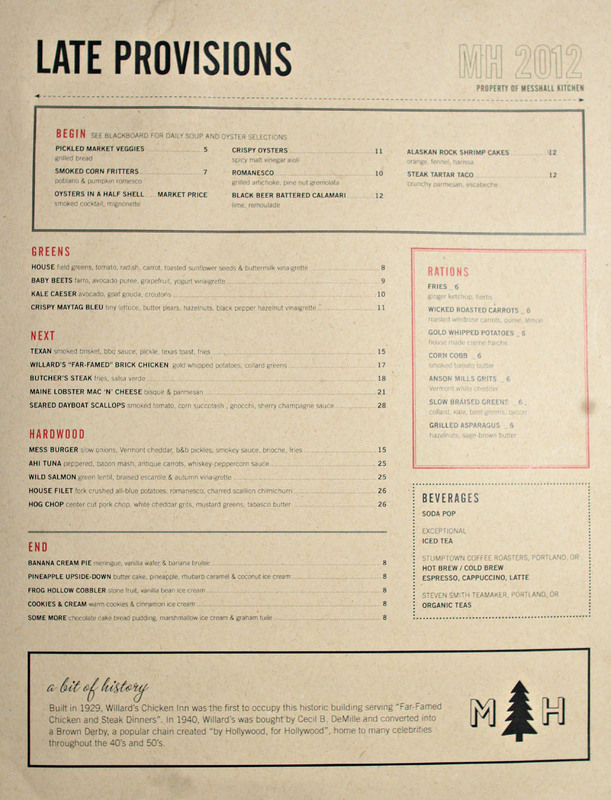 MessHall's menu comprises an uncomplicated selection of gastropub-y fare supposedly inspired by dining hall cuisine, but interpreted through a distinctly modern American lens. 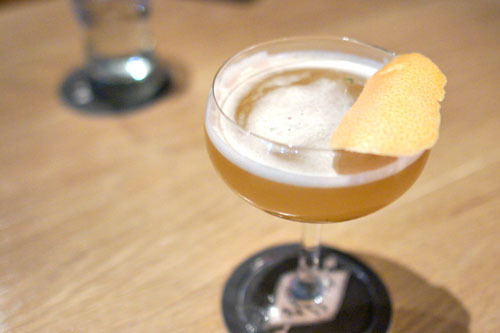 To drink, cocktails were originally planned to be the work of Julian Cox and Josh Goldman, but the two have since been let go and superseded by Erik Lund, himself a JC protégé and former Rivera barman. He was actually signed on to MessHall even before Cox/Goldman were attached, and given the duo's departure, gone are their oft-touted "molecular" flourishes, replaced by Lund's older-school mixology. 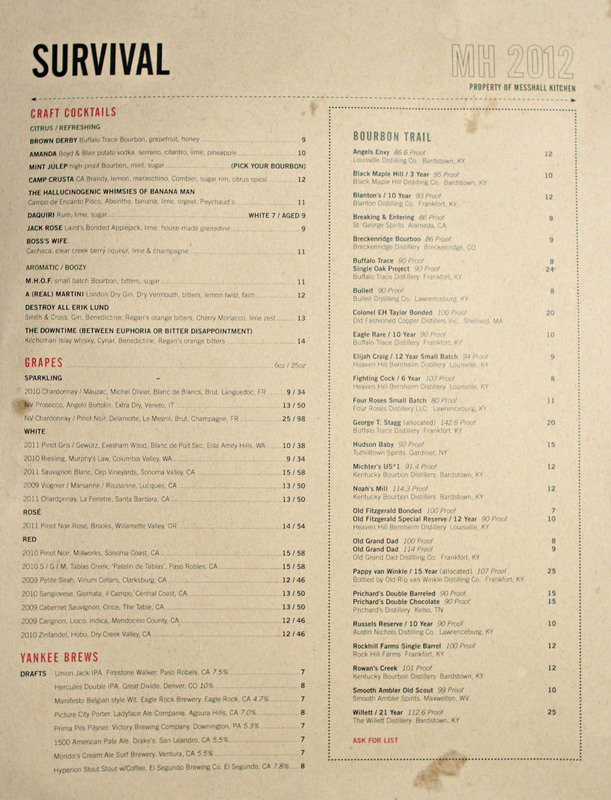 If cocktails aren't your thing, there's even a decent selection of wines (selected by Goldman), as well as an array of beers on draft and by the bottle, not to mention a godly list of bourbons. Click for larger versions. Given all the hullabaloo surrounding MessHall's bar program, we decided to go with cocktails for the entire evening. First up was one that's apparently a favorite of Serritella's wife. 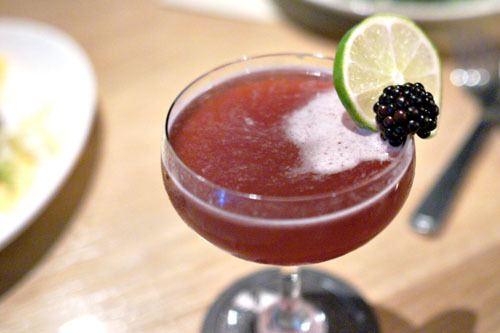 It definitely goes over well with the ladies, but was hardly "girly," with a very noticeable berry sweetness from the liqueur sure, but also a great counterbalance from the booze and tart tints of lime--my dining companion even likened it to an adult jungle juice! 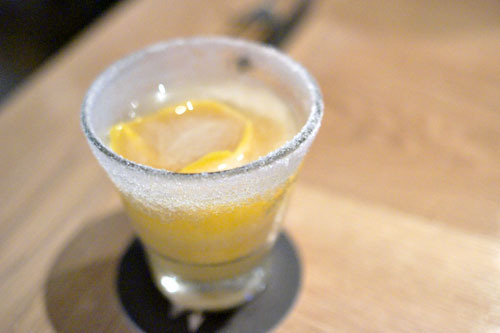 Meanwhile, I also enjoyed the "Banana Man" as well, with its almost tropical sugariness and subtle banana character, beautifully moderated by the weight of the absinthe and pisco--delicious. 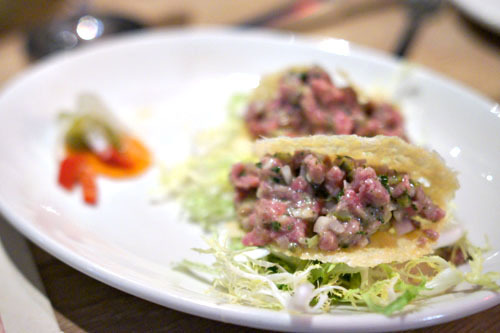 Miniature "tacos" were a great way to start the meal. The meat itself was tender, yet with a satisfying chew, displaying a bovine goodness that paired perfectly with the tanginess imparted by the steak's escabeche marinade. I much appreciated the saltiness and crunch provided by the Parmesan shells, too. Here, I was afraid that the rock shrimp would be overwhelmed by the filler inherent in the cakes, but fortunately, the essence of the crustacean was proudly conveyed. Still snappy and springy, with a satisfyng bite, the shrimp deftly bestowed a marked brininess to the course that paired successfully with the slight spice found in the harissa. 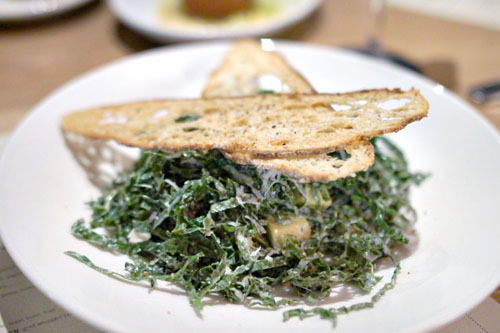 Our server recommended the whimsically-named Kale Caesar, but unfortunately, we weren't in love with it. The dish was a bit one-dimensional, and really needed more "Caesar" character, though I did thoroughly enjoy the incorporation of avocado into the salad, which added some interesting focal points and textural play to the course. The aptly-monikered Brown Derby was rather to my liking, with a very apparent foundation of Buffalo Trace, one that was expertly moderated by the saccharine heft of the honey, as well as by the tartness of the grapefruit--very well balanced. I also liked the Camp Crusta (reminds me of Kamp Krusty), with its wonderful blend of citrus and sugary flavors, all over a moderating base of brandy. Next up was a course ostensibly inspired by the roast chicken served by the original occupant of the building. We had here a butterflied half chicken, deboned, and cooked under a brick (or some other weighty object). 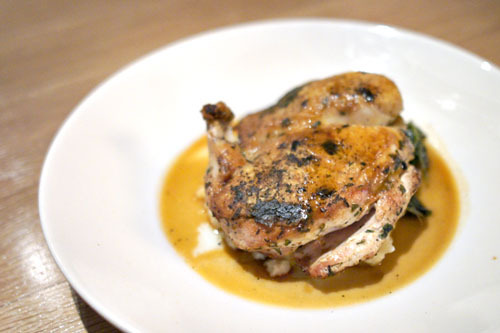 The resultant bird was quite nice: tender, still succulent for the most part, with a crisp, savory skin and good flavor. And the collards and mashers? Fitting accoutrements. 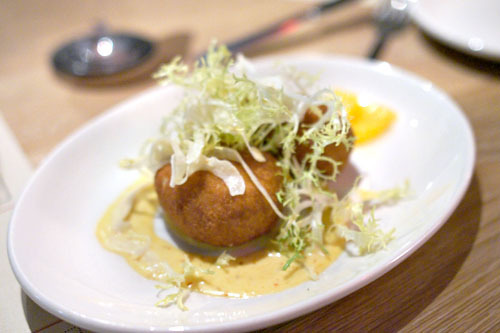 We see now the dish advertised by MessHall's new publicists as "the chef's favorite item." Coincidentally or not, it's also the most expensive item on the menu, and some may question the value of three scallops for $28. 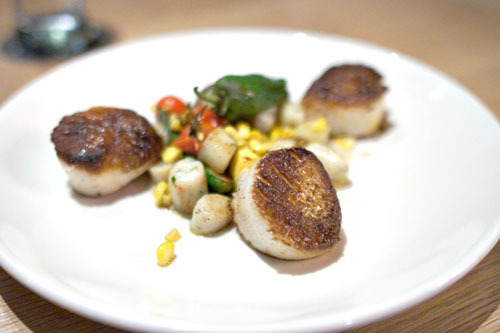 That being said, the scallops were pretty delicious: gorgeously caramelized, with a soft, supple bite and loads of briny-sweet savor. They were certainly tasty alone, but the light, bright flavors imparted by the various veggies (the corn in particular) formed a great complement to the seafood, and I even enjoyed the fluffy bits of gnocchi as well. 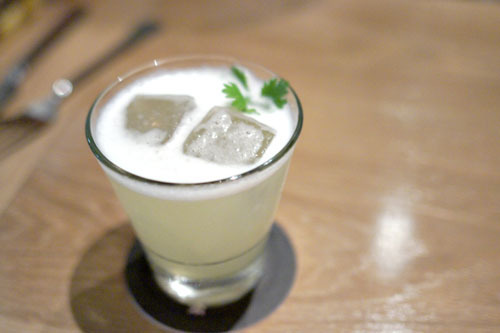 In our final round of cocktails, we went with the Amanda, with its coy, but not cloying burst of pineapple on the palate, keenly offset by the herby spice of the cilantro-serrano combo--couldn't really taste much of the vodka at all. Last up was "The Downtime," which is actually a cocktail carried over from Rivera. 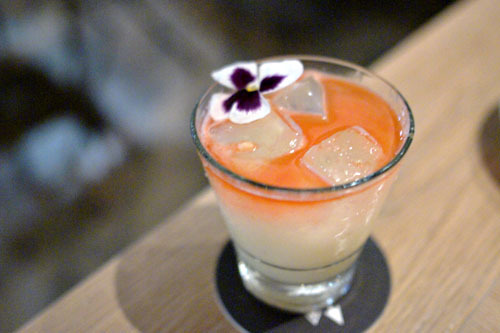 The drink was listed under the "Aromatic / Boozy" section of the menu, and it certainly was, but not overwhelmingly so. 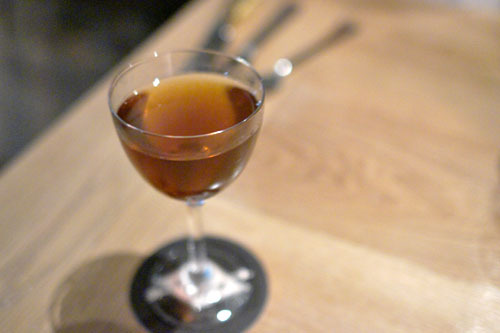 I actually found it utterly balanced, with a delightful smoky character duly joined by the herbaceous bitterness of Cynar and Bénédictine, with the Regan's adding just the right about of sweet spice to the mix. As we all know, any decent gastro-tavern must feature a burger on the menu, and so here we are. 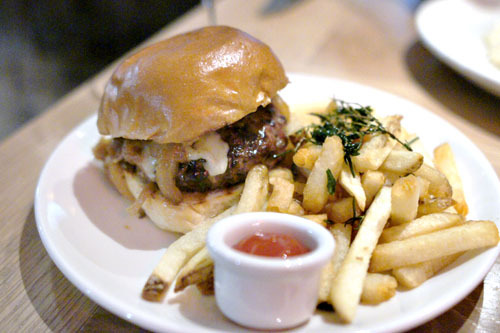 MessHall's effort was good, with a well-cooked medium-rare patty showing off a prototypical beefiness that melded well with its topping of cheddar. I even enjoyed the subtly-sweet onions, as well as the integrating aioli, but really wanted to get more from those B&B pickles. The paired French fries, meanwhile, were spot on and quite tasty, even better with a dab of ketchup. For our final savory course, we went with the hog loin chop, again at our server's recommendation. Taste-wise, things were on point, as I quite reveled in the dish's unabashed pork-iness, and appreciated the tender, toothsome consistency of the meat. 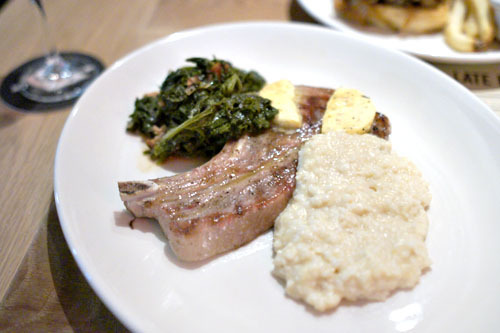 Grits and greens fit the mold admirably as well, forming an apt counterpoint to the pig. I was, however, concerned with the size of the chop, which seemed a touch dainty to me. 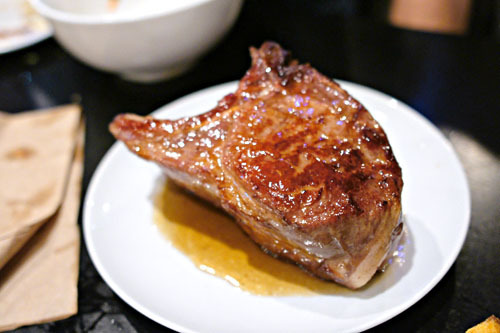 I would've liked something more substantial, such as the excellent, several-inch-thick Maple Glazed Pork Chop I had recently at Playground. 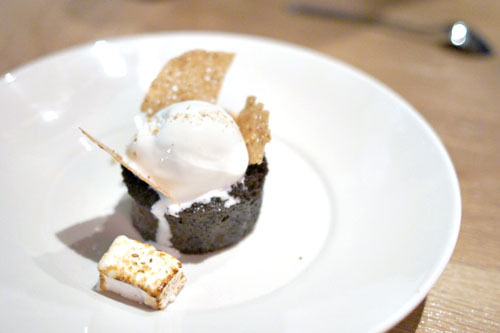 Dessert riffed on a classic campfire treat: the lovable s'more. I'm not so sure if quite evoked the essence of the traditional preparation, but it was damn tasty nonetheless. I'm generally pretty blasé about chocolate cake, but this one I found particularly, and inexplicably appealing, blending flawlessly with the ice cream, which I also adored. The graham cracker chip, meanwhile, added a nice touch of crunchiness to the dessert that I much appreciated. Yum. 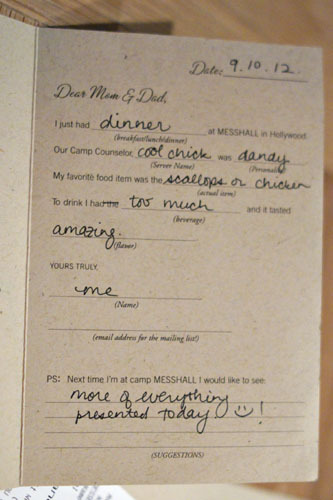 I was generally pleased with our experience at MessHall. The food was straightforward conceptually, and delivered well for the most part. I had a couple quibbles, but nothing too damning, nothing that can't be tweaked. Meanwhile, cocktails were commendable across the board, so I definitely won't bemoan the loss of Cox and Goldman, as Erik Lund appears to be running the show just fine. Service was pretty on point given the circumstances, with my only concern being that pacing was somewhat off at times. In the end, MessHall looks like a nice spot, and I can only imagine how much of an improvement it is over the Louise's that used to occupy the building; in fact, I really see the restaurant growing into a sort of neighborhood staple--a consummate fit for the area. so, go for the drinks? just what i had suspected. Sean: You make it out yet? Care to report back? Anon: Nah, you can enjoy the food as well. Just be mindful of what to order.